– Let’s start with our notice, with a contribution by Danilo Iosz and Laura Eisenhower. This last makes part of the inside of the same unique contribution. The notice of this meeting was never fully confirmed, although over the years a number of witnesses present at the military base at that time, began to admit that something “special” had actually happened. “It’s time that the secrets of the contact between the U.S. government and the aliens are revealed. Yes, it is true, the United States is in contact with extraterrestrials and know that some UFO sightings has an extraterrestrial origin. As my name suggests, I am the great-granddaughter of President Dwight D. Eisenhower, and I must tell you right now that I’m almost certain Ike was aware that some aliens were visiting our planet. In many ways, this is obvious. It is said that Marnie, my great-grandmother and former first lady entrusted something about it to the father of the well-known UFO researcher Ed Grimsley. The military-industrial complex has thrived in secrecy and it is likely that any revelation that will be made about UFO will be manipulated in order to keep secret the reasons why this topic has been hidden for a long time behind us. I have good feelings about Obama and I suspect that he might reveal something, but will be forced to close his eyes to certain realities that he might not be aware of. Most of what has taken place in secret, has produced the inevitable tragedies, such as secret government projects costing trillions of dollars taken from our taxes, which had useful purposes only for a certain elite group. These projects included: colonial settlements on other planets (Mars , nd.r. ) , experiments designed to influence and change the behavior of certain people classified as a threat ( mind control , so to speak , ed), the Secret Space Program, but also HAARP weapons , underground bases and strategic false strategic events . “We are in a time of crisis, because of the poor performance of man in every “sector” , looking for the “proper ” at every opportunity to find the right one to relaunch it and give, according to the insiders who ” trades “in this case on this fact, a ” breath ” to the ” worn out ” and now outdated term” UFO ” . The program for those who give life to these conventions (*) , like that of San Marino, is now more well known : to propose the sale of a book, which in the end does not reveal anything , the presence of some researchers , in order to attract attention to increase tourism in the area , signaling its presence , with the intervening of some other character in memory of important events interpreted but in its own way , to lose sight once again to the people , that they should no longer be deceived , but continue to be, about the true nature of the Electromagnetic Extraterrestrial Aircrafts which are present in our skies and their pilots who guide them. Just to be fair, we hope that the great-granddaughter of President Ike Eisenhower may have been in a position to know someone from among those ” speakers ” present at the conference, and therefore she may have been informed and, at a later time, tell to the general public, about how her grandfather lived and with whom he was in contact at that time which was so important for the future of humanity. 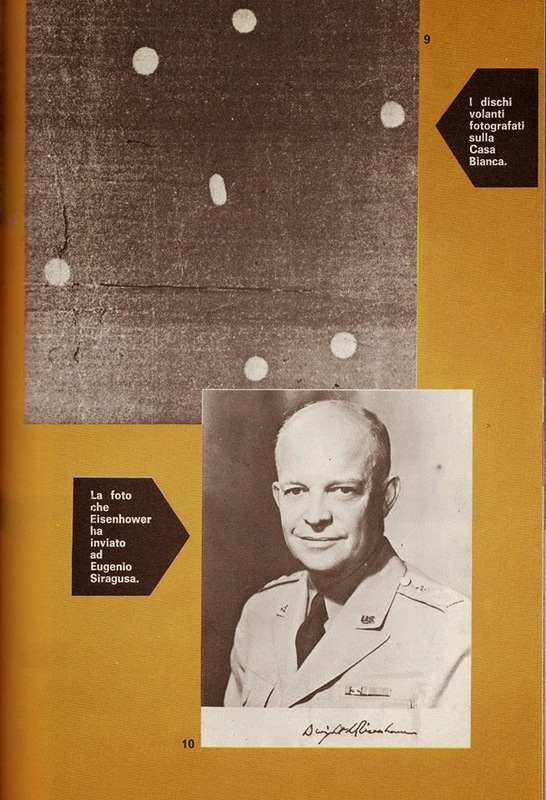 (*) In 1985, the newspaper Nonsiamosoli draws from the book ” The Giants of the Sky” (*) published only in Italy, republishes extending it to the whole world, an important article on the contact that the American President ” Ike” had had with a delegation of Extraterrestrial Beings belonging to the Interstellar Confederation in mission on our planet, for the salvation of mankind, and the epistolary conversation he had with the contacted Eugenio Siragusa. 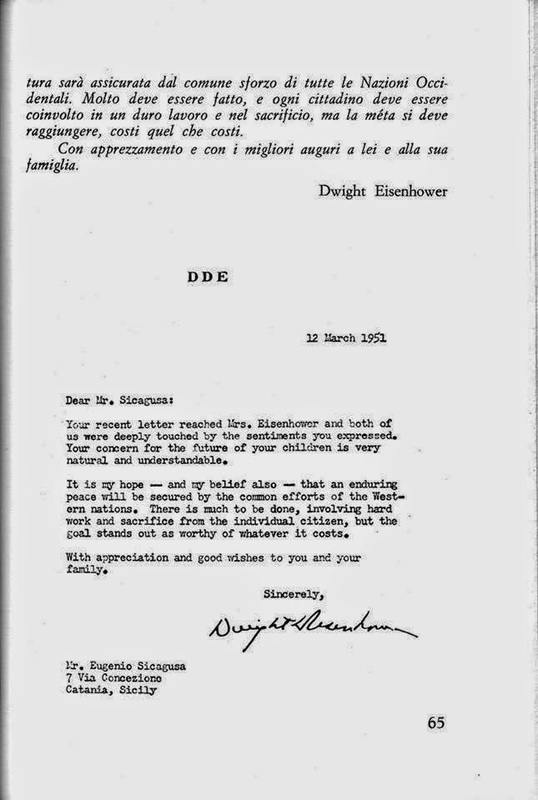 The President Ike Eisenhower, had from the beginning -and on more than one occasion during his messianic mission-, an epistolary correspondence with Eugenio, sharing with him the primarily concern about Youth and what pertained to their future destiny. 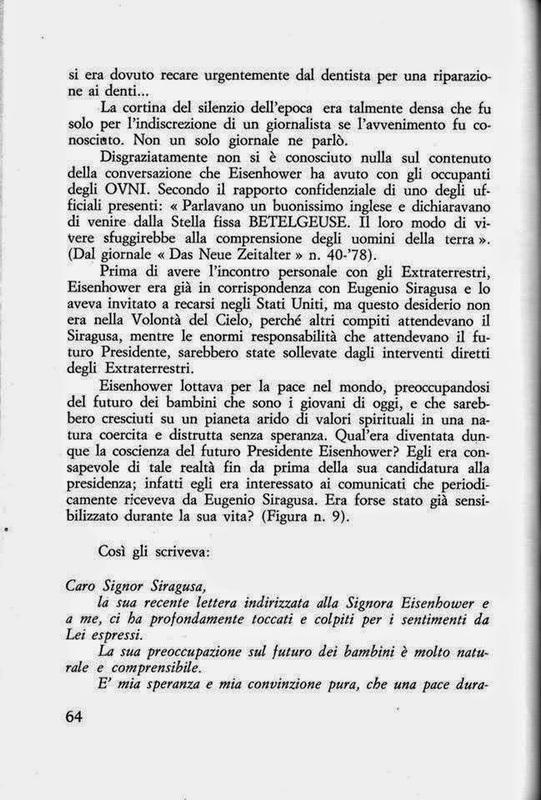 Remember that the President, in fact, had an encounter with extraterrestrials who conveyed to him that humanity would have 50 years of time to “put things in their proper place ,” and told him that he also would contact with their emissary : Eugenio Siragusa . 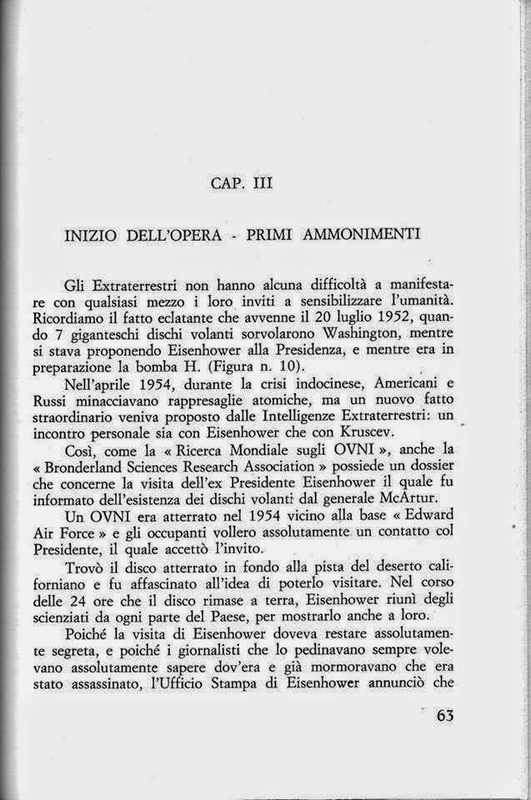 That’s why the revealed mystery of how a humble shipper of Sicily at the 50´ had been in contact personally with the president of the United States. The great granddaughter of the president, speaks of a truth that have closely characterized (*) the messianic work of Eugenio, by the will of the Extraterrestrials: Planet Earth is a living organism, dimensional doorways, Energy for the Evolution of the planet, the plurality of inhabited worlds, Man’s life was not by chance -but with an order and a definite purpose to the creative economy of the cosmos. Herman Oberth (MODERN ASTRONAUTIC PIONEER, MASTER OF VON BRAUN ) ; VLADIMIR AZHAZA (ASTROPHYSICAL AND FORMER CHAIRMAN OF THE SCIENTIFIC STUDY OF UFO IN RUSSIA ) ; PEDRO ROMANIUK (Pilot of Argentina Air Force (FAA), Professor of meteorology at the military school and director of the National Board of Investigation Air Accidents FAA, pioneer of ufology in Argentina, by his experience as pilot was deployed to support the secret research of Unidentified Flying Objects UFO) ; WERNER VON BRAUN ; ALEXANDER KAZANTZEV ( MEMBER OF THE ACADEMY OF SCIENCES IN SOVIET UNION ) ; FELIX ZICHEL ( ASTRONOMER AT THE INSTITUTE OF AVIATION IN MOSCOW ) ; JOSEPH F. Blumrich ( NASA ENGINEER) ; Clyde Tombaugh ( discoverer of the PLUTON PLANET ) ; L. GORDON COOPER ( ASTRONAUT ” Mercury 7″) ; SCOT CARPENTER ( ASTRONAUT ” Mercury 7″) ; JAMES MC DIVITT ( ASTRONAUT ” GEMINI 4″) ; Edwin Aldrin ( Apollo 11 Astronaut ) ; DONALD Keyhoe ( MARINES RETIRED MAJOR ) ; JIMMY CARTER ( FORMER PRESIDENT OF THE UNITED STATES ) ; DWIGT EISENHOWER ( FORMER PRESIDENT OF THE UNITED STATES ) ; ALBERTO Perego ( FORMER ITALIAN CONSOLE ) ; Paul VI ( Pope Paul VI ) ; PIUS XII ( PAPA PACELLI ) ; FRANK DRAKE ( American astronomer ) ; CARL SAGAN ( exobiologist OF NASA) ; Jim Hurtak ( ACADEMY OF SCIENCES U.S.A. ) ; MEL NOEL ( MILITARY PILOT ) ; U- THANT ( FORMER UN SECRETARY ) ; CARDINAL Samore ( SECRETARY OF STATE OF THE VATICAN SECRET ARCHIVES ) ; OCTAVIO MORETRA JULIO LIMA ( AIR MINISTER OF BRAZIL ) ; January CARLOS CASTRO CAVERO ( AIR COMMANDER OF THE REGION OF THE CANARY ISLANDS – SPAIN) ; CAPTAIN OF A JAPANESE BOING 747 KNJIU Terauchi ( The SIGHTING HE HAD LET astonished THE investigators, IN FACT, AS he said: ” The spaceship WAS GREAT AS TWO AIRCRAFT CARRIERS , IN PROPORTION TO IT, THE PLANE SEEMED A MIDGE “). While now it is little left; God’s justice could erupt at any moment. “We are not alone ” nor are we deprived of heavenly comfort in the speech that we bring to awaken the human consciousness to a serious examination, in order to close the way to the tireless and pernicious delirium of perdition , destruction and death. The “Angels of yesterday, today extraterrestrials” and the Greatest Love of all loves are with us.